Cold Beef, Ham and Cheese Picnic Loaf, Thyme for Cooking summer gourmet. Chop Prosciutto as finely as possible. In a large bowl lightly beat eggs with a fork. Add the bread crumbs, onion, garlic, wine, eggs, Worcestershire sauce, ketchup, ham and mix well. Add the beef and mix well, using your hands, kneading it like bread. Divide mixture in half and place half in large baking dish, patting it into the shape of a loaf or pack into a 9 X 5 (22.5 x 12.5cm) loaf pan. Place the cheese on top leaving 1/3" (1cm) all around. 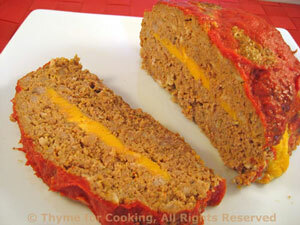 Top with the remaining meat, patting into shape to cover the cheese, pat / pinch around the edges to seal. Bake at 400 F (200C) for 45 minutes. Remove, spread 1/4 cup ketchup evenly over the top.